Cockney urchins? Horse-drawn carriages? Actual top hats? Assassin's Creed Syndicate has been announced, all right. As predicted, it's set in Victorian London and stars two assassins: Jacob and Evie Frye. You'll play as both of them over the course of the game, building up your underground gang to oust Templars from their positions of power. Above you can see a nine-ish minute playthrough of a section of the game. If that is too big an ask on your attention, here is a much shorter (and more traditional) trailer. Assassin's Creed always stirs up a lot of mixed feelings from people—PC gamers especially. I'm personally looking forward to it in that same way I look forward to any AAA-fluff. 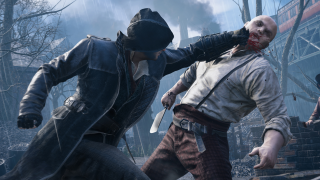 Assassin's Creed Syndicate is out October 23 on consoles, and the annoyingly-unspecific "Fall 2015" on PC. For more, read our preview here.